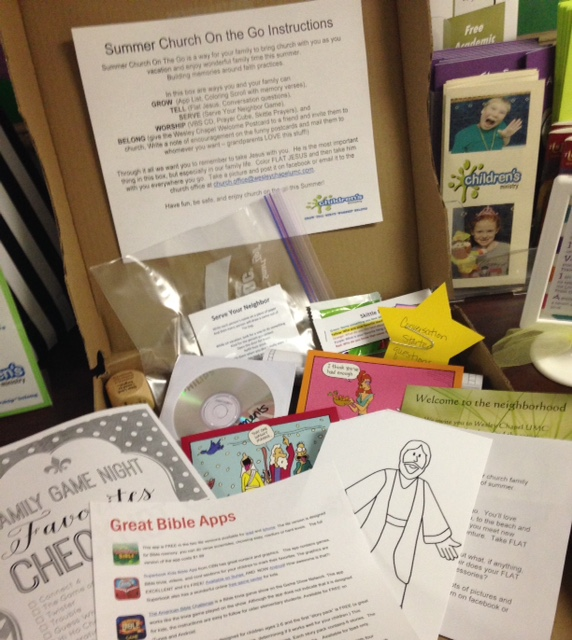 Since January our families have been picking up Praying On The Go Bags each month to build their faith muscles in prayer with simple directions and a prayer prompter to take home. I wanted to do something different for July following Vacation Bible School and came across a great facebook post of a blog offering Take Out Church. Thankfully, everything they used with photos and pdfs are at the link. Gotta love it when colleagues share their goodies! Through it all we want you to remember to take Jesus with you. He is the most important thing in this box, but especially in our family life. Color FLAT JESUS and then take it with you everywhere you go. 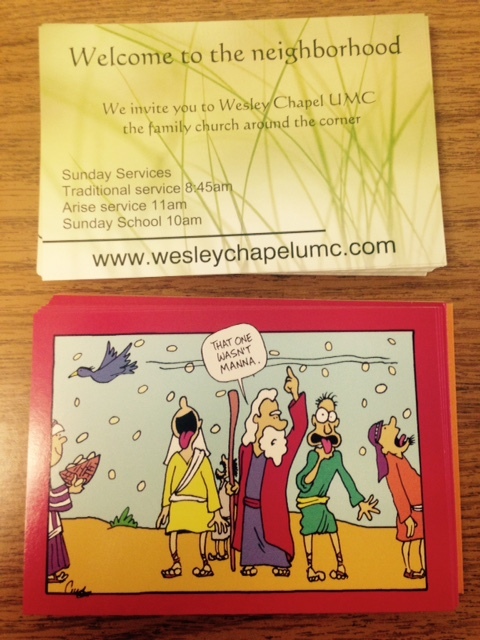 Take a picture and post it on facebook or email it to the church office at church.office@wesleychapelumc.com. Have fun, be safe, and enjoy church on the go this Summer! We introduced the boxes at the children’s moment the Sunday following VBS as a way to continue growing in our faith during the next month when most of us might hear, “Mom, I’m bored.” It was quite dramatic to see a stack of pizza boxes near the church office and the kids headed straight for them after services were over. What is your follow up to VBS? Two mornings last week had me awakened by my eye twitching. Instantly the old southern wives tales came to mind of ‘someone must be talking about me’ or ‘I’m going to come into money’, or is that if your palm itches? Anyway, it’s eye twitching season for me. My eye begins to twitch when the VBS signup board outside the office has way more white space than names. My eye begins to twitch when I’m not sure if the Science Camp folks have the registrations that will encourage them to come back next year. My eye twitches when I discover I’ve texted the wrong date for the 5th Sunday Family Service and find that several of the families are now going to be out of town or a little person has one last dance recital that very morning. My eye twitches when our conference has put together this awesome overnight retreat for tweeners, and I don’t know how many to register for since it’s still 90 days away. My eye twitches that vacation time is here and it is so much easier for folks to stay home from church even though we have a rocking Science Sunday school planned. 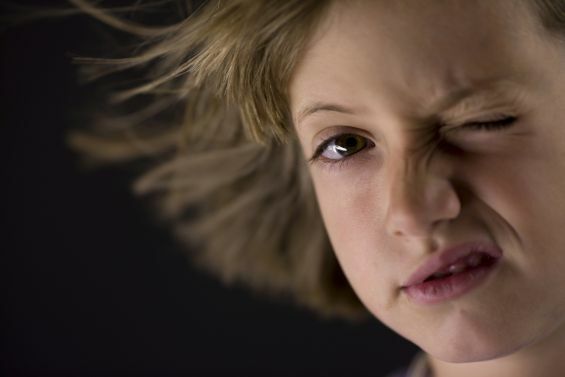 My eye twitches that I have only 2 out of 7 Sundays (in July, no less) with signed up helpers for summer Sunday school that starts in a week and a half. Oh and did I mention that #1 Son moved into his own apartment last weekend and Baby Girl is still way too far away as her 3 year old is a real 3 year old and I wish I lived close enough to take Mr Yummy for a night to let her sleep through the night? 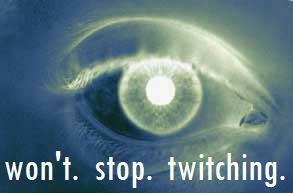 Yep, it’s eye twitching season. What do I do? I pray. I pray to ask God to remind me who (Him), why (kids to know Jesus and have faith tradition memories), when (His timing and the rhythm of my community), what (there is still a week or two to come), how (if he can multiply fishes and loaves, he can multiply hands and smiles and time) needed to make a season His. And I pray for more: more children, more volunteers, more families, more resources, more kindness, more patience, more love, more joy, just more. And then there’s a week later. When we had to add more chairs to the VBS training held after church on Sunday for more faces appeared than the names on the sign up board. When the Science Camp folks shared at the walk-through that we are full with a waiting list. When the voices shared for the Family First On The Fifth Worship service were many and fabulous (Gosh! I love it when tweeners can work a microphone in partnership with one another, a 6th grader invites the congregation to “meet and greet one another with a handshake and a smile”, a Dad and his two daughters lead the service in announcements and the call and response, and the high schooler who led corporate prayer and prayed from his bible!) When a saint of the church walks in on Monday to sign up to be a part of the team to lead Summer Science Sunday school for the first two Sundays of the Summer that begins this Sunday. When #1 Son is content in his new place. When Baby Girl realizes that God was so wise as to only offer 24 hours in a regular day…no more, no less. Eye twitching season and God. It’s more than I can even imagine.